Lakewood, NJ - A three year old Jackson girl who was pulled from the bottom of her family’s backyard pool in late June passed away yesterday, prompting calls for greater safety measures to be taken to prevent future tragedies. Sources who spoke to VIN News on condition of anonymity said that Mindel Rivka Gross was at the pool with family members when she slipped into the water unnoticed. She was pulled from the water approximately three minutes later, with a neighbor beginning CPR until Hatzolah arrived on scene. The little girl was rushed to an area hospital where she clung to life for three and a half weeks before succumbing to her injuries. The funeral will be held today at 2:30 at the Vizhnitz synagogue in Monsey on Phyllis Terrace followed by burial at the Vizhnitz cemetery on Route 306 and Brick Church Road. 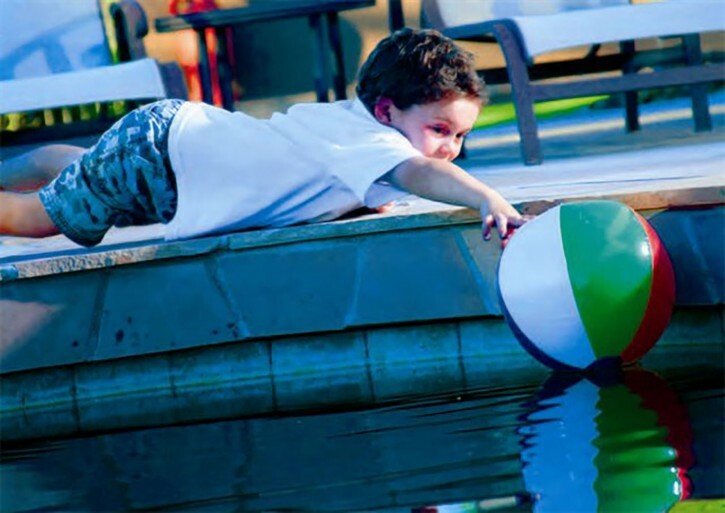 · Hiring a lifeguard at home pools, even if all family members know how to swim. · Posting signs at home pools listing emergency numbers such as Hatzolah or 911 and location of the pool including address, nearest cross streets and name of neighborhood to ensure that first responders can get to the scene quickly. · Calling for help from a land line and not a cell phone, whenever possible, which automatically provides dispatchers with the caller’s location and other crucial details. · Installing a dedicated poolside phone line that goes directly to Hatzolah, wherever possible, to prevent losing time looking for phones that can either be misplaced or are inadvertently left inside the house. A Hatzolah member also emphasized the importance of becoming certified in CPR, a minimal investment of time that can save lives, both when someone is choking or in the case of pool accidents. and a gate around the pool like in the picture. Oy,what a horrible tragedy! BDE. Ad mosai? Most important, keep a constant eye on the little ones! Don't let them out of your sight for a nanosecond! I spent 10 days with my father eho had a stroke, at the same time this little girl was in the ICU, and just hearing about the Gross family from both sides was a chizuk in its own right and a strong lesson in emunah & bitachon in our Creator of life and death. There is no question, that at least one or two family members in every family should learn CPR, and the Heimlich maneuver. Yehi zichrah barucha.